The theoretical maximum transmission speed of USB 2.0 is 480M per second, while USB 3.0 is as high as 5G per second, which is more than 10 times than that of USB 2.0 in theory. Of course, this is only the theoretical speed of USB interface, but this speed is limited by other factors. For example, although your USB disk is configured with USB 3.0, the maximum writing and reading speed of storage medium in the USB disk is far less than 5G per second. So sometimes the role of USB 3.0 is not maximized. The USB 2.0 port has a maximum current supply capacity of only 500mA. Some mobile hard disks with higher power consumption cannot work, and damage to the hard disks is common to happen even if they can barely work. USB 3.0 improves capability of power output, with up to 900mA per port and 4.5W of output power, which can meet the needs of most mobile hard disks. 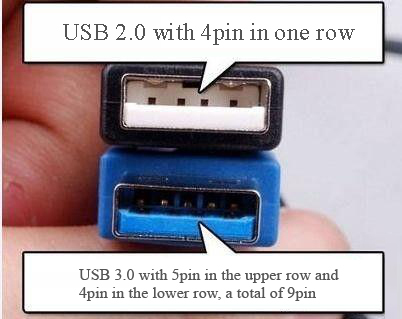 The standard A-type interface of USB 3.0 is backward compatible with USB 2.0/1.1, andtheir sizes are consistent. But the two interfaces are very distinguishable by observing the color. In order to distinguish from USB 2.0, USB 3.0 Primoter Group recommends that USB 3.0 interface is made up of blue base, so we can distinguish it from color; another more cautious method is observing the contact. 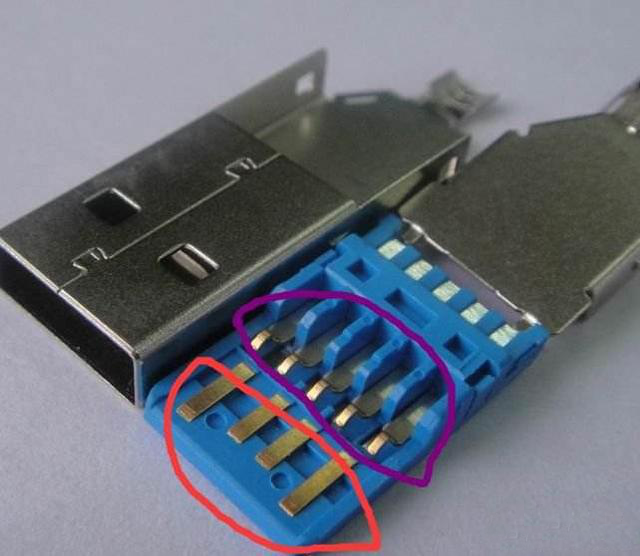 USB 2.0 only has 4pin metal contacts, while USB 3.0 is 9pin where the front 4pin is as same as USB 2.0 but the rear 5pin is exclusive. As for the B-type interface of USB 3.0, it is better to distinguish. The size in USB 3.0 standard B-type interface is larger than that of USB 2.0. Its upper part is more prominent in order to accommodate the new 5pin contacts. Taking the identity of USB 3.0 as example below, “SS” represents “SuperSpeed” which can be found in the interface of USB 3.0. In addition, USB 3.0 cable is slightly thicker than that of USB 2.0 due to the additional lines.